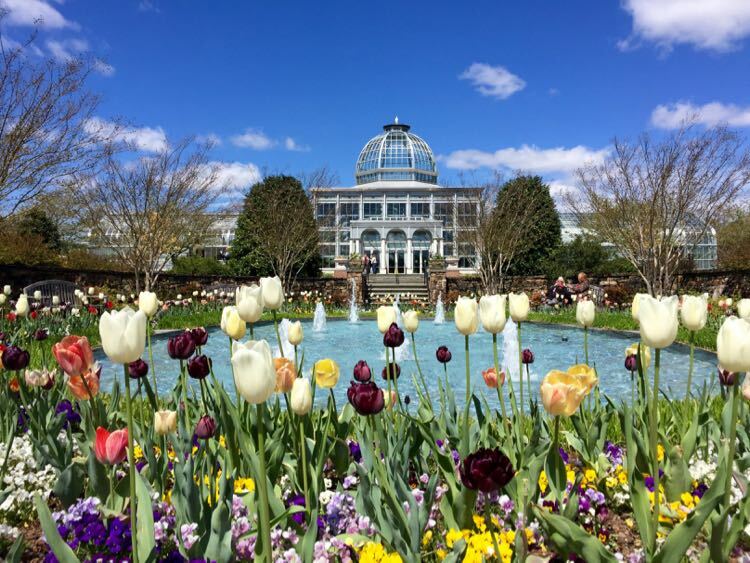 These short hikes, from easy walks close to DC, to more challenging climbs in the Blue Ridge Mountains, all include the payoff of spectacular Virginia views somewhere along the journey. 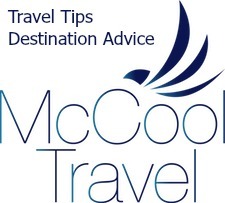 Hikes are listed in order of distance from the Washington Monument in DC, and many link to more detailed descriptions of the hike and how to reach the viewpoint. We’ve also included our subjective, casual hiker’s view of each trail’s difficulty; your mileage may vary. 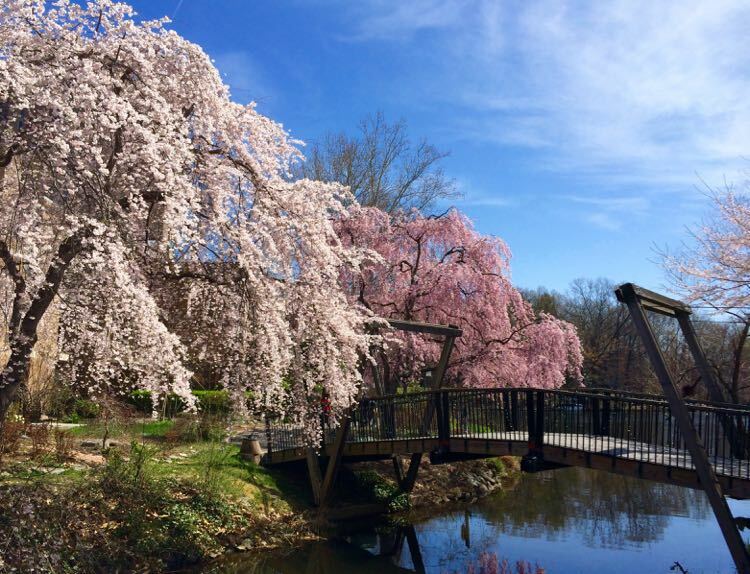 It may seem odd to think of Arlington National Cemetery as a hiking destination, but the streets of the cemetery offer beauty, history and a spectacular view of Washington DC. Arlington is a special place, solemn and heart-breaking, but beautiful and inspiring too. 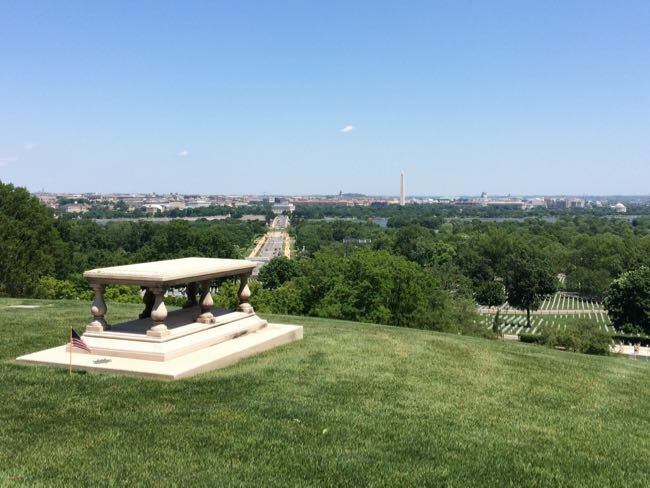 Skip the tram and the tourist crowds by taking an indirect route to Arlington House, or walk straight up McLellan Drive and right on the Crook Walk to the viewpoint near the Pierre L’Enfant gravesite. Hike length and difficulty varies depending on your route, but is at least moderately challenging due to the hills. Arlington House and the National Cemetery is just across the Potomac from DC. The views are more modest from the Observation Tower at Huntley Meadows Park, but the hemi-marsh habitat is so unique and fun to reach that we had to include it. 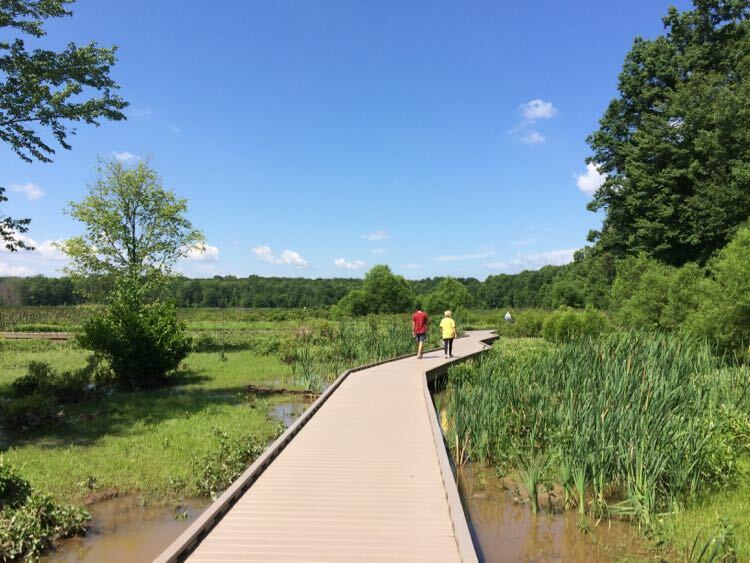 Huntley Meadows offers the only ADA-compliant boardwalk in Northern Virginia, and it is a favorite for birders, photographers, families, and anyone looking to escape the city without a long drive. Visitors reach the Observation Tower on a 1/2-mile boardwalk over the marsh; a perfect opportunity to observe birds, amphibians, and other wildlife. 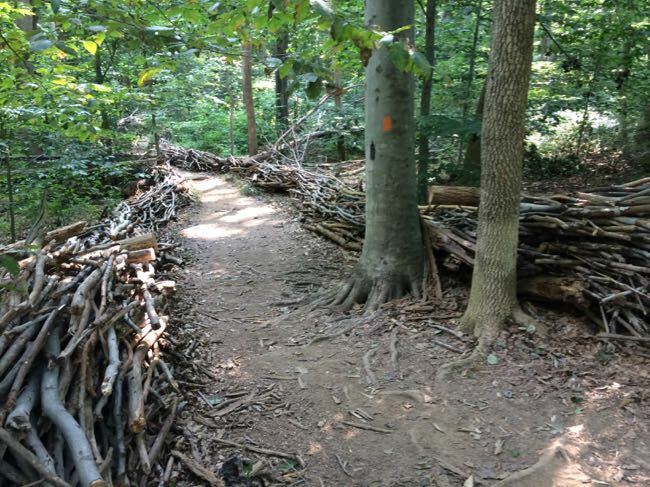 This is an easy, accessible hike about 12 miles from DC. Scott’s Run Nature Preserve is a popular stop for joggers, hikers, dog walkers, and families looking for a pretty waterfall not far from DC. 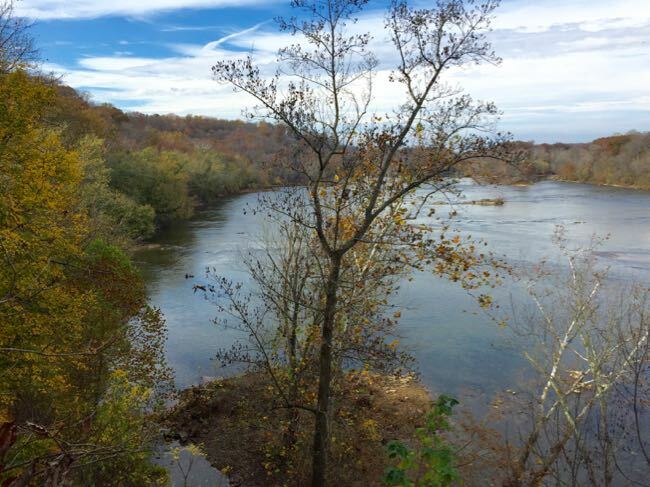 To reach the Stubblefield Overlook, we recommend a roughly 3 mile loop that starts at the eastern parking lot and follows a segment of the Potomac Heritage Trail. The Stubblefield Falls stretch across the Potomac is a class III rapid rather than a traditional waterfall. From the overlook you’ll have an excellent view up and down the Potomac, though portions are blocked with foliage except in winter. This is a nice spot for a lunch or snack stop before continuing on the PHT to the popular Scott’s Run waterfall. This is a moderately difficult hike, and Scott’s Run Nature Preserve is about 15 miles from DC. 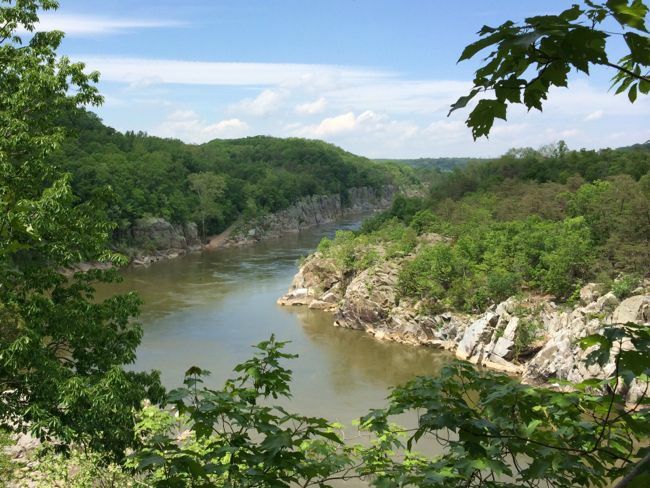 The view from Cow Hoof Rock, and an adjacent rock outcropping, gives you a beautiful up-river view of Mather Gorge and the Potomac River. 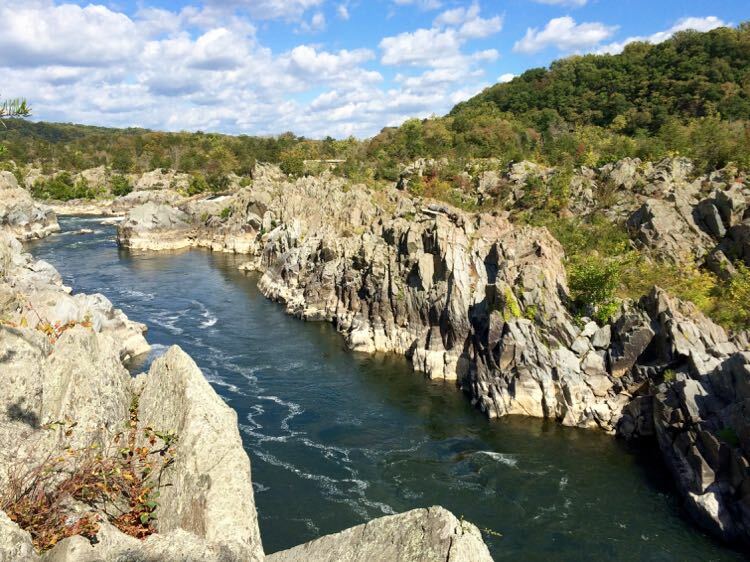 Our favorite way to reach the viewpoint is on a 3-mile Great Falls loop hike that follows Difficult Run, climbs to a ridge, then descends to the Potomac River, on shady dirt trails. Cow Hoof Rock makes a perfect stop for a picnic, and there is another nice spot just a bit further down if Cow Hoof is occupied. From this height you can see up the river to the steep walls of Mather Gorge, across to Maryland’s Billy Goat Trail, and down to kayakers passing far below you. The hike is steep and challenging in parts, but most of the trail is an easy walk. The Difficult Run trailhead is about 18 miles from DC. Virginia’s Great Falls Park is one of our favorite places to impress out-of-town guests, but it’s also a great solo hike on a quiet weekday. 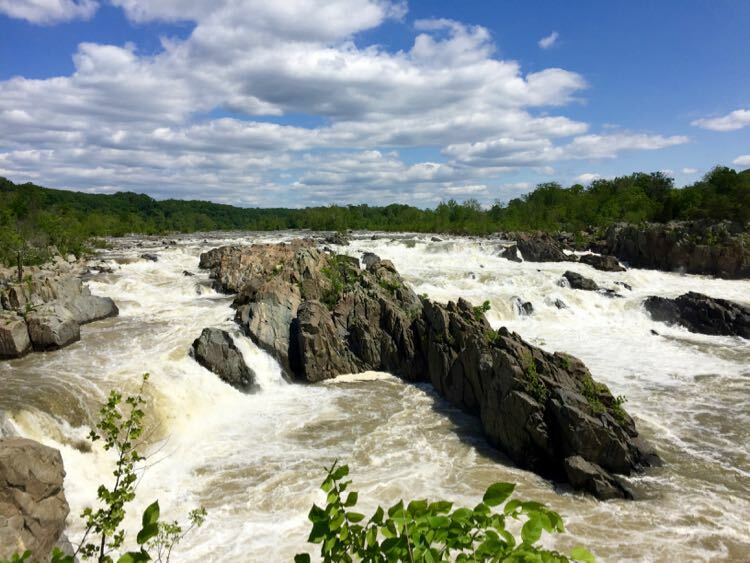 The popular River Trail, which follows the Potomac River east of the falls, is the best way to enjoy views of Mather Gorge. A short walk from the Visitor Center are three overlooks, each offering a close-up look at the river as it cascades over the falls. (Overlooks 2 and 3 are accessible but overlook 1 is very rocky.) Continue past Overlook 3 and follow the River Trail along Mather Gorge. Carefully explore the rocks overlooking the river for beautiful views, but keep a close eye on any youngsters. Eventually you’ll come to a plaque and a terrific view up and down Mather Gorge. Continue on to Cow Hoof Rock (see above) or return on the River or Mathildaville trail. Great Falls Park is about 20 miles from DC. 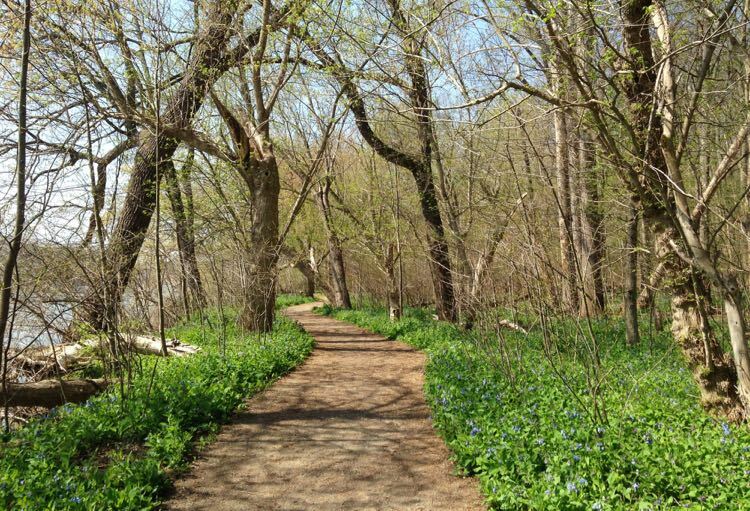 The 2-mile Lee’s Woods Trail climbs an historic bluff to beautiful views of the Potomac River, Neabsco Creek, and the park’s fishing pier. Freestone Point was the site of a Confederate gun emplacement during the Civil War. The 32-pound cannons positioned here were part of a series of batteries that effectively blockade the Potomac for five months. 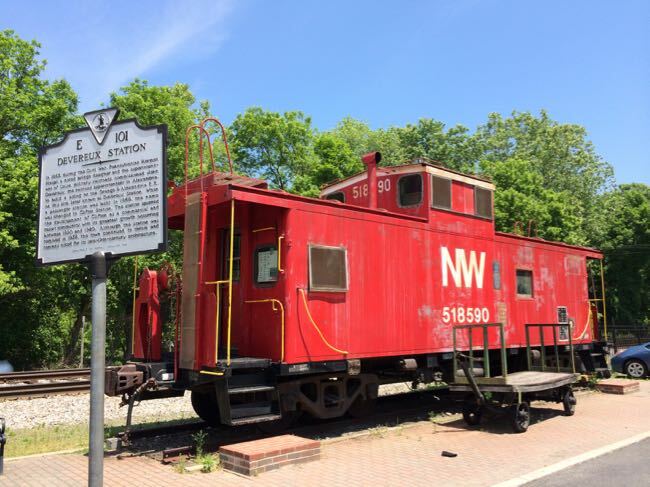 As you hike, you’ll hear the whistle of trains passing over the bridges and tracks that bisect the park; a fitting echo of the site’s history. The mostly easy hike over dirt paths has a few steep, but short hills. 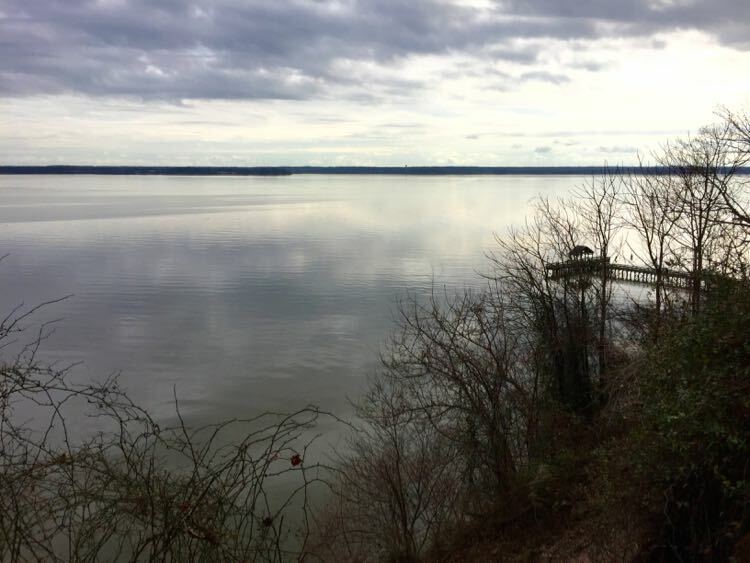 Leesylvania State Park is about 30 miles from DC. 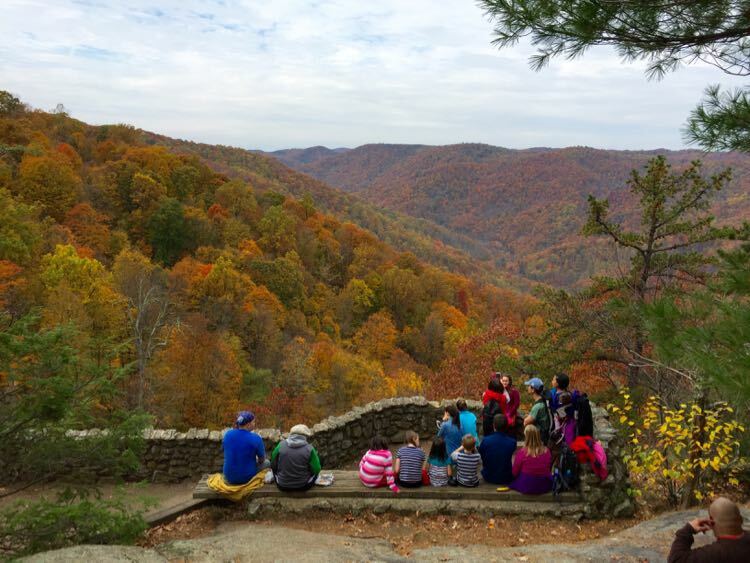 Sky Meadows State Park offers spectacular views across the Virginia Piedmont. We recommend a 4-mile loop hike that includes a mix of open fields, moderately challenging hills, and wooded segments, with the payoff of beautiful views to the south and east. 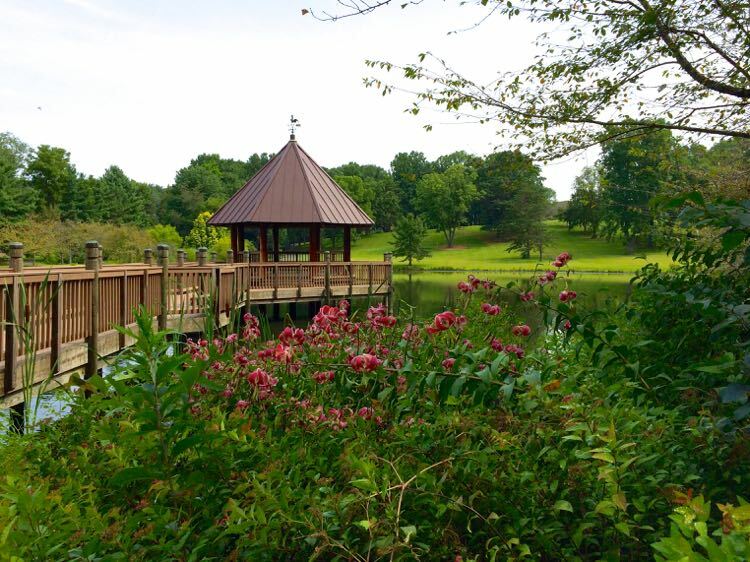 The Piedmont Overlook has several benches where you can enjoy a rest or a picnic as you soak up the view across Crooked Run Valley, down to the park’s Historic Area, and east to the taller buildings in Dulles and beyond. The 4-mile hike is moderately challenging due to the hilly, sometimes rocky terrain. You can also reach the viewpoint on a shorter, but steeper, trail. 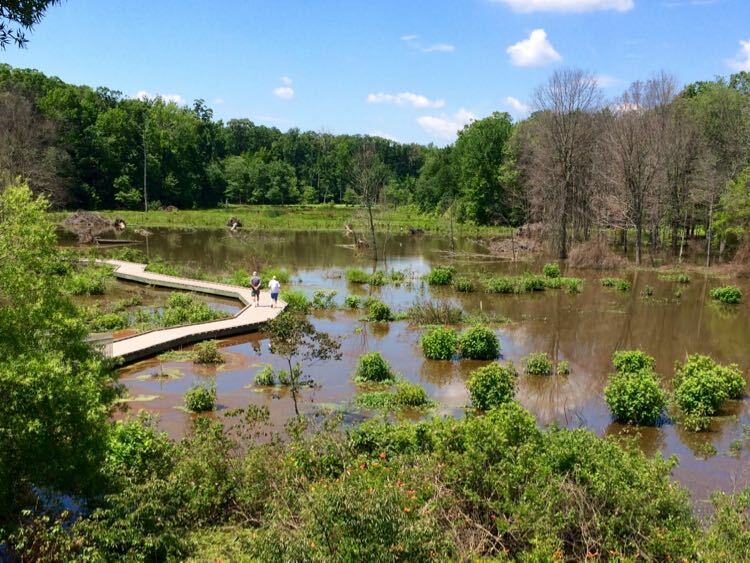 Sky Meadows State Park is 62 miles from DC. The Little Stony Man Overlook hike is only .9 miles roundtrip from the parking area at mile 39.1. The hike follows a fairly steep, rocky section of the Appalachian Trail to the Passamaquoddy Trail and a gorgeous viewpoint. To your right you’ll see a few segments of Skyline Drive winding along the ridge. Straight ahead is the town of Luray, with the ridges of Massanutten Mountain, divided by the New Market Gap, in the distance. The Little Stony Man parking lot is in Shenandoah National Park, about 90 miles from DC. Two miles further south on Skyline Drive, just inside the northern entrance to Skyland, is the trailhead for Stony Man Summit. From the parking lot, it’s a fairly easy 1.6 mile round-trip to the panoramic views from Stony Man. Even though the hike is longer than Little Stony Man, the path is less steep so it’s actually an easier walk. The rocky outcropping at the top of Stony Man offers glimpses of the drive to the north, Skyland Resort to the west, and the ridge continuing to the south. The Stony Man parking lot is in Shenandoah National Park, about 92 miles from DC. Mary’s Rock is a popular destination for Shenandoah National Park hikers because of the incredible, nearly 360 degree views from the granite out-cropping. If you follow our suggested hike to Mary’s Rock from the Jewell Hollow parking lot, you’ll reach The Pinnacles after about 1 mile of hiking. If you’re up for a longer journey, continue another 2.25 miles to Mary’s Rock. 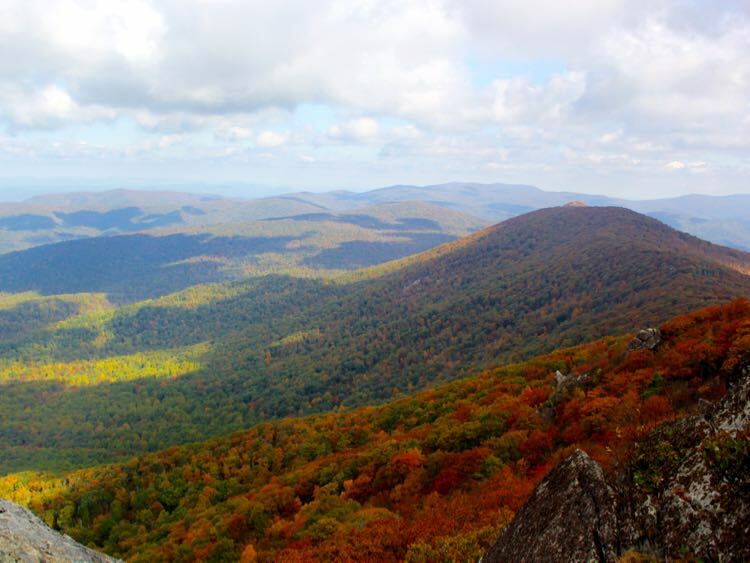 This out and back hike follows the Appalachian Trail over somewhat challenging, rocky terrain, with about 700 feet of elevation gain. The Jewell Hollow parking area is in the central portion of Shenandoah National Park, about 94 miles from DC. 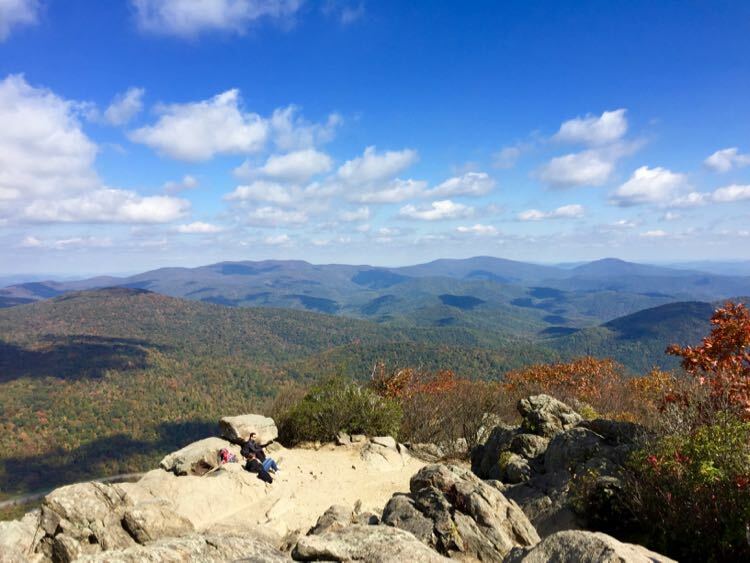 Hawksbill Summit is the highest point in Shenandoah National Park, and you can reach it on a fairly easy round-trip hike. The hike follow a nice wooded trail for the first 2/3s of the distance, then turns steeply uphill on a dirt road to the summit. Explore the rocky summit to enjoy views in nearly every direction. 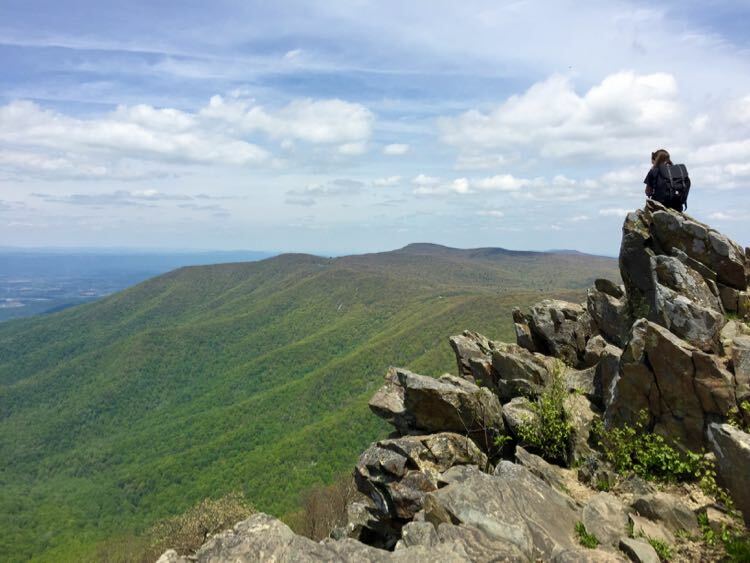 This is a fairly easy hike except for the hill, and the Upper Hawksbill parking area in Shenandoah National Park is about 99 miles from DC. 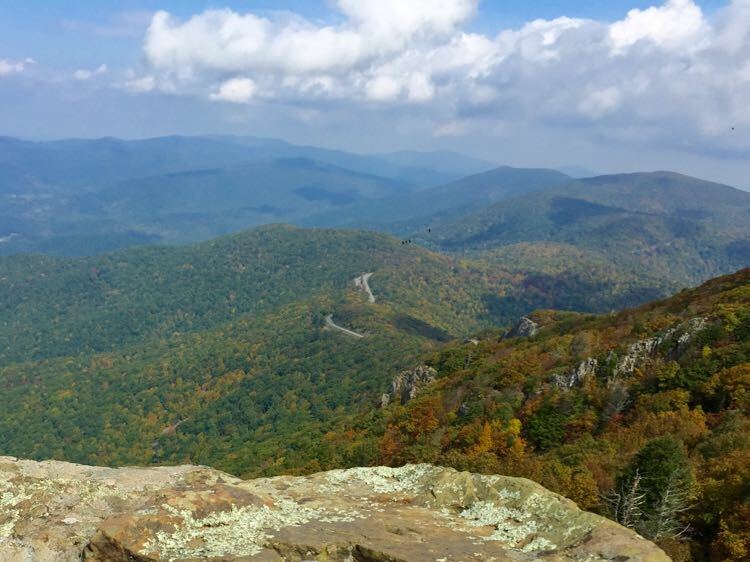 This hike along the Virginia/West Virginia border leads to amazing, 360 degree views from the summit of Big Schloss Mountain. 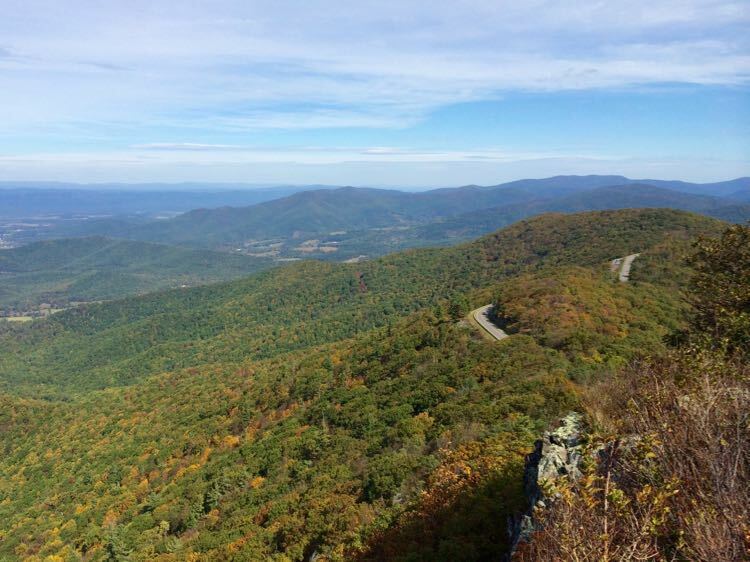 It’s a bit of a drive from DC and Northern Virginia, and it’s a challenging climb at the start, but the panoramic payoff is well worth the effort. 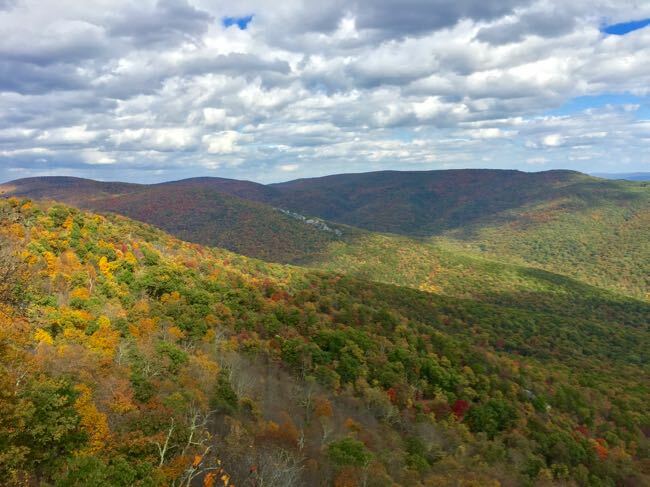 The Big Schloss hike begins at Wolf Gap Campground and follows the Mill Mountain Trail for a little over two miles where it connects to the quarter mile spur to the summit. Big Schloss was named by German settlers who thought the rocky summit looked like a castle (schloss in German). Though it is not technically difficult, we consider this is a challenging hike because of the steep climb. The trailhead is in the Wolf Gap Recreation Area, about 107 miles from DC. Daughter of Fun in Fairfax Va joined a sunset photography trip to Humpback Rocks (we haven’t made the hike yet), and shared this gorgeous photo with us. The trail is a steep, steady .8 mile climb to the rocky viewpoint. Not technically difficult, but a demanding hike due to the steepness of the trail. 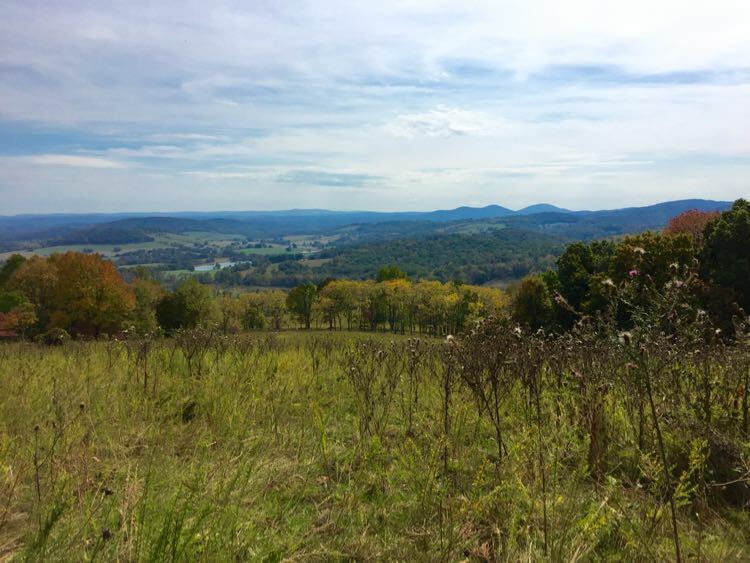 This is a very popular hike from the Charlottesville area, so expect to see other hikers during your visit. The out-and-back hike is just under 2 miles, and the Humpback Rocks trailhead is about 145 miles from DC. The viewpoint looks out over Tye River Gorge, but the hike is more popular for the gorgeous waterfall views as the trail climbs along Crabtree Falls. Crabtree is the longest vertical cascade in the East; a series of several waterfalls cascading a total of 1200 feet . From the lower parking lot, it’s a steadily uphill but not too challenging 1.8 mile climb to the top of the falls. There are several other great viewpoints of the cascades along the way, broken up by sections of stairs and dirt switchbacks. While the hike is well worth the effort, it is a very popular destination, so avoid weekends if you can. The trail is especially fun in Fall when heavier water flow and colorful foliage offer incredible sights throughout the hike. 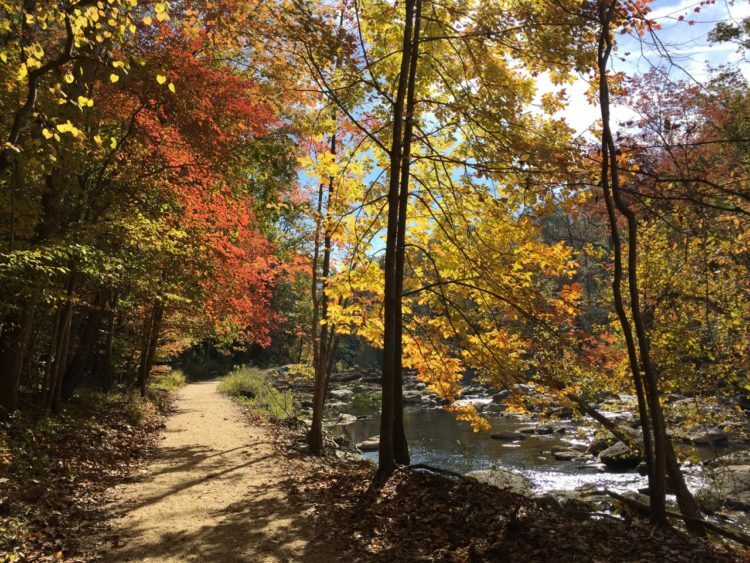 The Crabtree Falls trailhead is about 185 miles from DC. 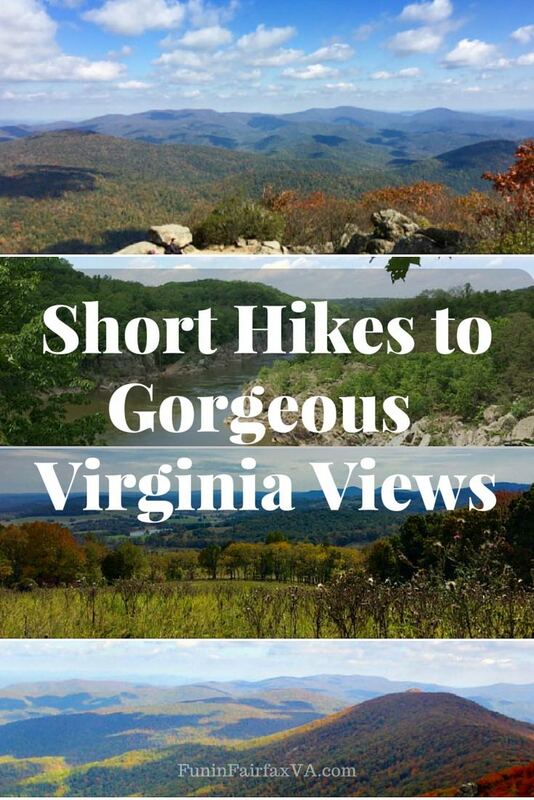 How many of these short hikes to Virginia views have you completed? We’d love to hear about your favorites in the comments. Wow! These views just kept getting better the more I scrolled. I’vê become quite a fan of hiking in recent years and I really like the look of Shenandoa National Park. If I ever get chance to visit Virginia, it’ll be high on my list of places to check out. 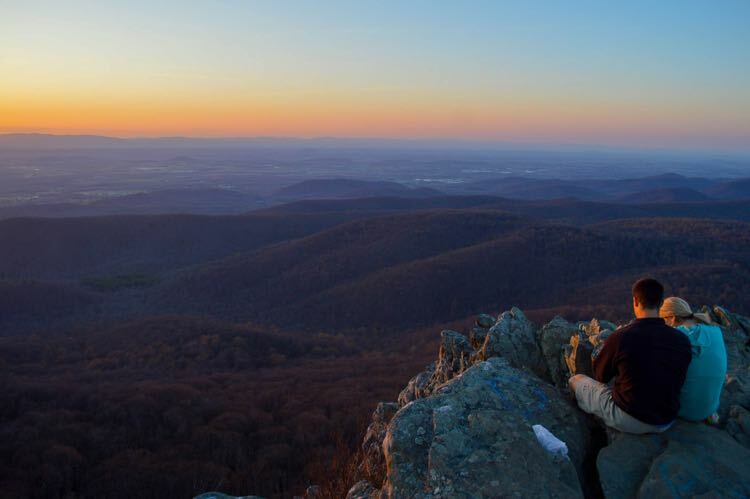 Yes, Shenandoah has some incredible hiking and views. Hope you get to visit sometime. Thanks Julie! 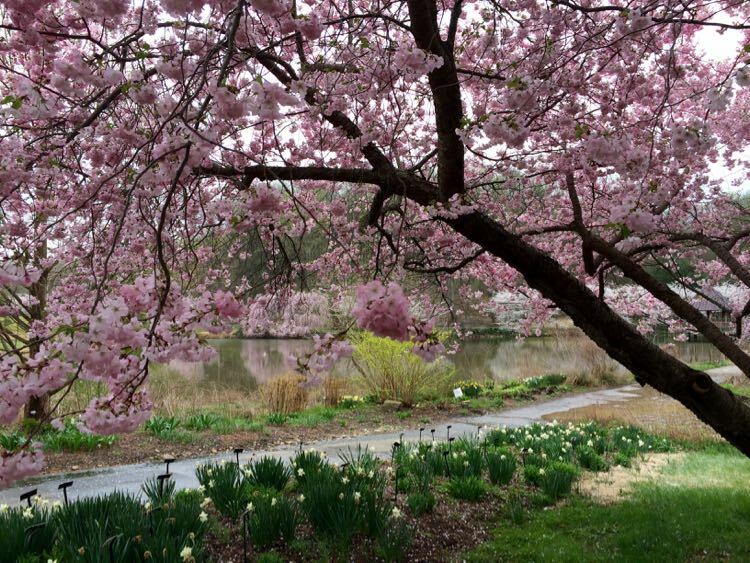 Stunning views showcase the beauty of your state. We need to experience Virginia in more depth and this will be a very helpful resource when we do.